by Susan DeRosa Archives - Art Matters! e Gallery is Open for Art in Bloom! Springfield artist Margaret Coe, Jacksonville artist Susan DeRosa, Eugene artist Margaret Prentice and Medford artist Lucy Warnick depict the beauty of the American Northwest working in their unique styles. They create lush landscapes in a variety of media including oil, acrylics, watercolor and mixed media. American Views: Emerging Landscapes presents four Northwest artists whose paintings capture the unique characteristics and beauty of the Oregon landscape. Artists include Margaret Coe, Springfield; Susan DeRosa, Jacksonville; Margaret Prentice, Eugene; and Lucy Warnick, Medford. A longtime resident of Eugene, Maragaret Coe received her MFA from the University of Oregon. She has taught art for many years at the University of Oregon, Lane Community College, and the Maude Kerns Art Center. Her expressive oil paintings with their energetic brushstrokes capture the natural ruggedness of the Northwest. Susan DeRosa received a BFA in Drawing and Painting at Laguna College of Art & Design, Laguna Beach, California. She applies acrylic paint using small brushstrokes to create paintings that glow and reflect light. This technique produces paintings that are reminiscent of the French Impressionists. Margaret Prentice is currently Professor Emeritus of Art at the University of Oregon where she taught for 26 years. She received her BFA from the University of Arizona and her MFA from the Univ. of Colorado. She has exhibited her work in over 250 exhibitions nationally and internationally. Her lush landscapes in oil are realistic vistas depicting the farmlands and rolling clouds of the Willamette Valley. Lucy Warnick received a BFA in painting from the University of Oregon and has worked as a teacher and arts administrator in Southern Oregon and Houston, Texas. Her work has been exhibited throughout the country. 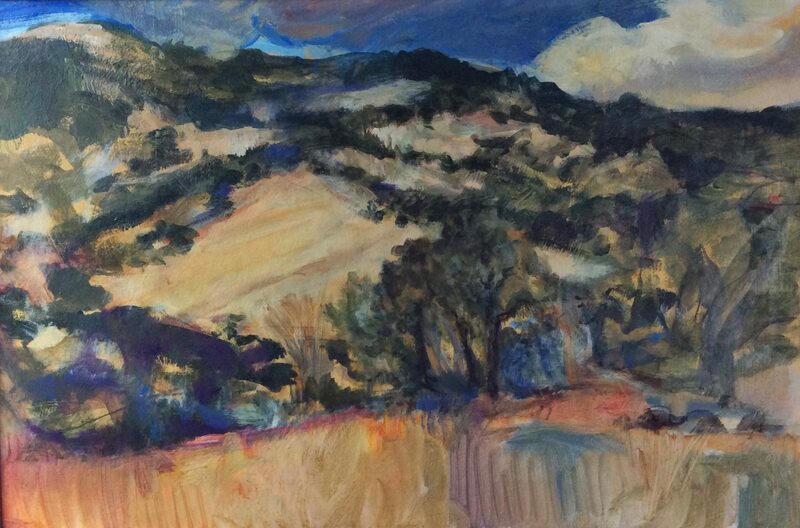 Viewers will recognize familiar Southern Oregon landmarks in her paintings. Lucy uses bold, uncompromising brushstrokes accented by playful black lines to create her lively paintings. Medford photographer Tom Glassman is known for his quirky, unusual, and graphic images, which are created in-camera without the use of image editing software. Glassman uses abstract lines and patterns, unusual reflections, and the juxtaposition of colors and shapes to create images that are at the same time thoughtful and humorous. He photographs found objects with distinct background/foreground layers in close proximity that aren’t typically seen together. At first glance, Tom Glassman’s photography contains elements of strong composition with balanced color and form. Upon closer examination, the image may reveal a more complex pattern or invite the viewer to engage in a humorous dialogue. Youth Summer Camps Now online! Enjoying the spring flowers? Learn to draw and paint them from life! Instruction includes color theory and watercolor techniques. Workshop concludes with students creating a still life watercolor painting from a live flower arrangement. Debut Art Show for Susan DeRosa at South Stage Cellars in September!